The Auckland Kindergarten Association (AKA) has a programme of upgrading the children’s outdoor areas within their kindergartens. Over time sites become worn and various play elements can be out-dated. The redesign of the Roskill South Kindergarten was a two-stage development (to meet available budget) that sought to meet the needs of the teachers while stimulating children’s imaginations. 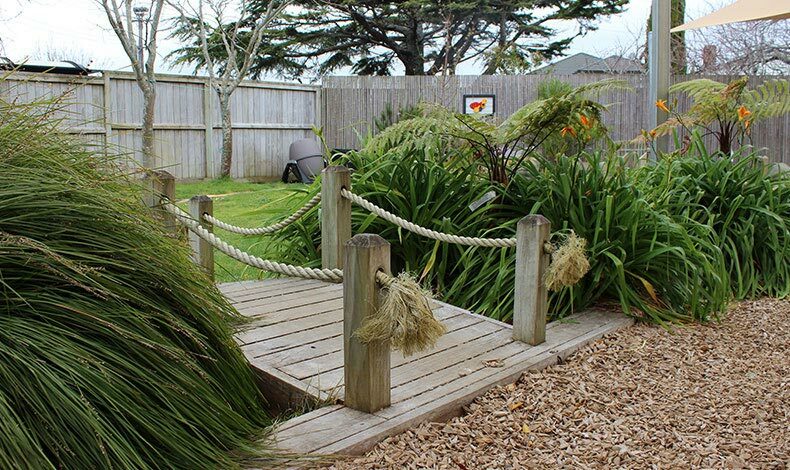 In consultation with teachers and the AKA, the Roskill South Kindergarten outdoor area was redeveloped with adaptable natural play features that were free from hazards. The new design flows freely, providing ease of use and access. There are areas for children to play and ‘work’ by growing vegetables and ornamental plants. Planting opportunities are maximised to provide shade and a natural play surface was sought as opposed to an artificial safefall surface. A natural waterplay area enhances play opportunities in the sandpit. It features a bridge and adaptable pier which can be a pirate’s ship or a fairy grotto, through simple decoration and a little bit of imagination. Children’s artwork and mosaic pavers leading into the kindergarten add a colourful touch and flax cutout details in the fence allow for children to look through and wave goodbye. The fale structure offers space for quiet play and for teachers to read to children.